If you’re looking for culture, a bit of exercise, picturesque views and tasty local food, all while avoiding masses of tourists, this day trip to Sha Tin is just for you! On this day trip to Sha Tin you will visit the 10000 Buddhas Monastery, have lunch in a local restaurant at Lek Yuen Estate Market and experience cycling in Sha Tin along the Shing Mun River and then up to Tai Po. This off the beaten path experience is something everyone can enjoy. If you’d like someone to guide you on this day trip to Sha Tin, so all you’ll have to do is focus on the sights, sounds and tastes, just give a click below! When you Cycle in Shatin, the main things you’ll want are water and sun protection, especially if you do this in the summer months. A couple of snacks wouldn’t hurt either. Make sure to have a look at our suggestions below too. These shoes are great on trails, roads and on bicycles. They’re sturdy, good value and perfect for cycling in Shatin. It never hurts to have a rain jacket. On the off chance that the weather turns, these will keep you dry and a bit warmer. We love these water bottles because they are insulated and reusable. Reduce your plastic waste by using these! If you hike cycle in Shatin on a sunny day, you will want to protect yourself from the sun. This camera and lens is super high quality. Also, this whole setup is weatherproof too, so it’ll be fine in light rain. Everyone knows about the Big Buddha on Lantau Island, but the Ten Thousand Buddhas Monastery in Sha Tin is much lesser known. Located at Po Fook Hill and built in the 1950s, this is one of the most intriguing places we have been to in Hong Kong. Catch the MTR, using the light blue line, to Sha Tin Station. At Sha Tin station, use Exit B – Grand Central Plaza, and turn left. Head straight and follow the ramp down. This is the ramp you’ll walk down. Turn left down Pai Tau Street when you see this big Ikea sign. Continue up Pai Tau street until you see the white archway with the green roof. This is the entrance to the cemetery. Do not enter here. Instead take the path to the right of the yellow sign to 10000 Buddhas. Follow the pathway to the right of the small yellow sign. At the end of the path turn left, then follow the path straight, and you will come to the entry point for the Ten Thousand Buddhas Monastery. This is the entry point to the 10000 Buddhas Monastery. There are a number of different shrines, halls and statues to visit at the Monastery. This is just a glimpse to entice you to go and experience it for yourself. A day trip to Sha Tin wouldn’t be complete without a stop here. Gold Buddha Statues line the pathway. Golden Buddha statues (otherwise known as Arhats) line the walkway up to the top of the Monastery, each with a unique pose and facial expression. They represent those who have achieved enlightenment. The walk up is quite steep and has 400+ steps, so take your time. There are plenty of opportunities to sit and rest at the shelters along the way. These are a couple of our favourite statues. Posing for a photo while taking a rest! Ironically, the Ten Thousand Buddhas hall contains more than 12,000 Buddhas. It also holds the remains of the Monastery founder, Reverend Yuet Kai, inside the prominently displayed glass cabinet. No photos or video are allowed inside the hall. Also, make sure to behave respectfully as this is place of worship. Unfortunately the pagoda was not open during our day trip to Sha Tin, but when it is open you are able to climb to the top. The monastery is open every day from 9am to 5pm (subject to typhoon warnings). Admission into the monastery is free! We spent one hour at Ten Thousand Buddhas walking around and taking pictures. The great thing is there are no queues and hardly any tourists, so it is nice and easy to get pictures and videos. If you’re super hungry at this point in your day trip to Sha Tin and can’t wait for the fantastic restaurant we detail below, there is a vegetarian restaurant at 10000 Buddhas. There are 400+ stairs to walk to the top of the monastery. Even without a lot of fitness, the climb can be done. Just take your time, and stop at the rest shelters. Even if you can’t make the full climb, you will still be able to enjoy the golden Buddhas that line the pathway. This monastery does not have any residing Monks. Do not give donations to anyone dressed like a Monk. These “monks” are merely scammers. There may be monkeys around the area. Do not pat or feed them. Again, remember to be respectful eg. be quiet and don’t climb on Buddha statues. It is a place of prayer. Wear good walking shoes and bring water with you. There is a toilet and small shop onsite, but it is only accessible once you have reached the top. After working up an appetite from climbing the path at the 10000 Buddhas, we decided to get some lunch at a restaurant called Shing Kee Noodles, located in Lek Yuen Estate Market. This restaurant was recommended to us by one of our friends who has lived in Sha Tin his whole life and knows many of the best spots to eat. If you’re here for dinner time, their hot pot is also regarded as one of the best in the area. Either way, during your day trip to Sha Tin make sure to stop at this classic locals’ eatery. On Google Maps, Shing Kee is located right here. However, it is quite difficult to find, and we spent half an hour walking around getting lost. We hope the instructions below will make it easier to find for you than it was for us. From the Ten Thousand Buddha Monastery make your way back to Pai Tau street, and follow it back to the big Ikea sign right here. Turn left when you see the mall. Turn left past the outside of the shopping centre. Walk up this sidewalk, then follow it as it veers up to the right. Continue until you reach the subway sign, then take these stairs down. Walk under this building into the square. Turn left after the blue and white striped tarpaulin/at the break in the hand rail. Go straight ahead for Shing Kee Noodles, which is where we had lunch. If you’re keen to explore, go left and up the stairs for the markets and various other eatery options. This is the entry to Shing Kee Noodles. Even if you still manage to get lost (like we did), the locals are very friendly, and they pointed out the Shing Kee restaurant to us. The owner of the restaurant was very excited we came to eat at the restaurant and wanted to know how we knew about the place. Shing Kee has very funky decor, and it seemed to be a favourite with the locals. Order the noodles, as this is their speciality! They have a wide range of noodles and toppings e.g., vegetable, prawn, beef, fish ball, and even pig blood curd, pig skin and turnip. Shing Kee Noodles is open daily from 9:30am to 4pm and then 7pm to 11pm. Note: Shing Kee serves Noodles at lunchtime and then changes to a hot pot restaurant at night time. We had a beef noodle soup, prawn wonton noodle soup and a drink for under $100HKD. We spent about an hour from the time we left the Ten Thousand Buddhas Monastery until the time we finished lunch. But enjoy this day trip to Sha Tin at any pace you’d like! We had no difficulty ordering food. The menu is in Cantonese and English. After our bellies were full with food, it was time for us to exercise and head down to the Sha Tin waterfront for a leisurely cycle. We rented our bikes from the Good Luck Bike Rental Kiosk, and we biked to the Tai Po Waterfront Park. There are plenty of signs along the way, but Google Maps will certainly help you navigate while you’re riding on your bike. However, getting to the bike rental kiosk from the Shing Kee restaurant was a little tricky, so if you don’t want to get lost during your day trip to Sha Tin, you can use our picture directions below. To get out of Lek Yuen Estate and down to the waterfront so you can do some cycling in Sha Tin, follow the pictures below! When you exit the restaurant turn left, walk straight until you get to this point, and then take the path on the right that passes under the building. Do not go up the stairs. Turn right at the end of this road, and then immediately turn left. Walk around the side, and snake around the back of the Hong Kong Down Syndrome Association building. Exit this gate, and turn left. Walk to the main road, and turn right. Cross the road at the lights. Follow this road until you see the sign for the footbridge. Climb the stairs until you come to this door. Turn left when you exit the doors. Continue straight along the path, and then follow this footbridge to the bottom. Follow this sign to the bike kiosk. Follow the Bike Kiosk signs. Go down the stairs to the underpass, and you will reach the river. Turn right. This is the Good Luck bike shop. A number of bike shops including the Good Luck bike shop will be on your right. You can hire a variety of bikes including family three wheeler bikes by the hour or for a full day. If you aren’t sure how long you will be, we suggest to get the bike for the full day, as it felt quite affordable, and as cycling in Sha Tin is super fun. This is one of the views you’ll get while cycling in Sha Tin. This bike path from Sha Tin to Tai Po is very easy to follow, and it parallels the waterfront for most of the way. However, if you’d prefer to use Google Maps in addition to the posted signs, just head to the Tai Po Waterfront Park. It’s beautiful all along the way! When you get to this junction, follow the signs, and turn left for the Tai Po Waterfront. There is plenty of sights to see when you’re cycling in Sha Tin and heading north up to Tai Po. We have included some of the highlights below. This is the “golden egg” at the Hong Kong Science Park. Did you know it’s actually an auditorium? A view of Tsz Shan Monastery and the Pat Sin Leng mountain range in the background. There is fantastic hiking at Pat Sin Leng, if you’re looking for another day trip up in the New Territories. Cycling along the Tai Po Waterfront – Tolo Harbour is in the foreground, and Ma On Shan can be seen in the background. 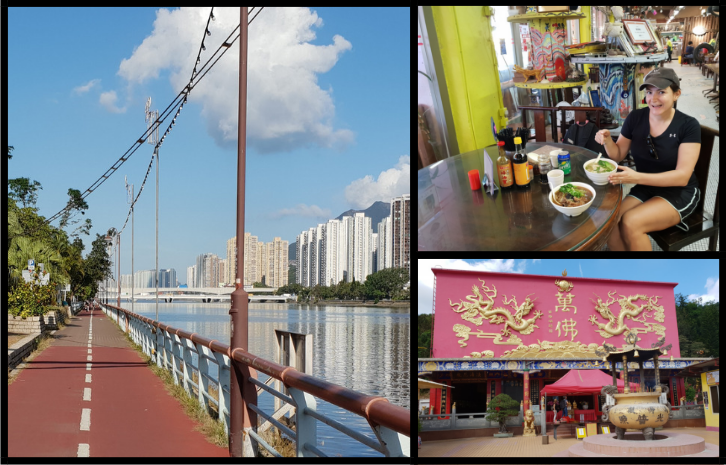 If you’re keen to explore more of the beautiful waterways and delicous eateries of Tai Po, you should consider doing a Tai Po Walking Tour. This place and many more are included in the tour. We finished our bike ride at the Spiral Lookout Tower at the Tai Po Waterfront Park, and then we concluded our day trip to Sha Tin by riding back to the Good Luck Bike Rental Kiosk to return our bikes. We enjoyed a beautiful sunset on the Shing Mun River during our ride back to Sha Tin. Besides the sights, it was great to be outside and to see so many people enjoying the beautiful sunny day. People in the parks were practicing Tai Chi, men on the wharf were fishing, and teenagers were flying past me on their bikes while pumping loud music. To add to the experience, I did not notice anyone else who appeared to be a tourist, and many of the people we met along the way were very lovely and would wave and say hello. The Good Luck bike rental kiosk is open from 9am to 7pm everyday (check their hours for public holidays). The cost depends on your bike, your drop off location and whether you hire a bike for a full day, or just a couple of hours. It is always cheapest if you drop the bike off back at the same location. To give an indication of price, to hire a bike for a full day and return it to Sha Tin, at the time of writing, it was 70 HKD, but there is the option to drop off your bicycle at the Tai Po Waterfront Park for 80 HKD. If you aren’t sure where you are going to drop the bike, pay the higher amount to give yourself flexibility. With photo stops and a very leisurely ride, we took 2 hours from Sha Tin to Tai Po. On the return trip with no stops we completed the trip in 1 hour. When cycling in Sha Tin and even on your way up to Tai Po, you will be on a dedicated bike path with only a couple of road crossings. It is very well maintained and mostly flat, so it is a nice, easy and relaxing ride. The path from Sha Tin to the Tai Po Waterfront Park is 11.1km one way or 22.2km return. Either option is suitable in the context of a day trip to Sha Tin. Bring water, hat and sunglasses, and wear sunblock. Make sure you bring cash to pay for the bike, as they don’t accept credit cards. Before taking off on your bike, check that the brakes, bell and gears all work properly. Ask for a helmet at the bike shop. Bring a light if you think you will be riding anytime near or past sundown. Bring your ID, as some bike rental shops may ask to see this. Don’t lose your receipt for the bike, as they will ask for it when you return the bike. Go on a weekday, if you are not a confident bike rider. The weekends get very busy on the bike paths, and riding at that time could be quite nerve-wracking for a beginner. Wear appropriate attire such as sports wear and sports shoes. There are a number of cafes near the Hong Kong Science Park, and there are also a number of toilets along the way. Be careful! I saw multiple people fall off their bikes because they were riding too fast. Get Out and Enjoy a Day Trip to Sha Tin, 10000 Buddhas and Even Some Cycling in Sha Tin! From the culture to the food to the exercise, a day trip to Sha Tin will show you that this off the beaten path part of Hong Kong has much more to offer than merely being home to a famous horse racing track. The best part of all is that this day trip to Sha Tin won’t cost you very much money at all! 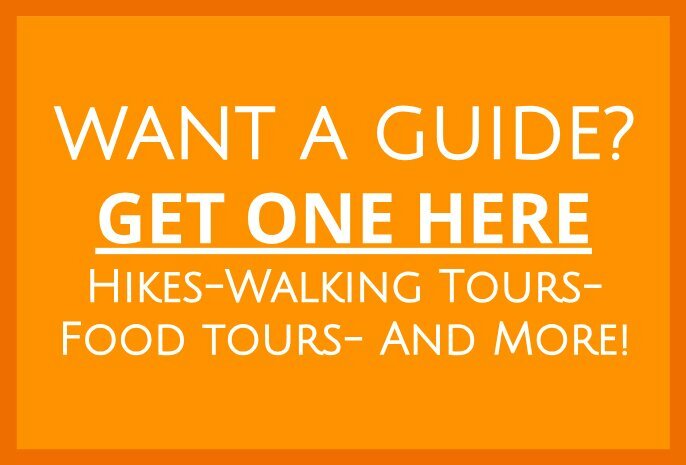 And if this foray into the New Territories has simply wet your appetite for more experiences up in this captivating area, consider hiking the Dragon’s Back of the New Territories or the waterfalls at Ng Tung Chai or again, this family-friendly Tai Po walking tour! Whatever you do, if you have any questions, leave a comment below, and someone will get back to you in a flash! 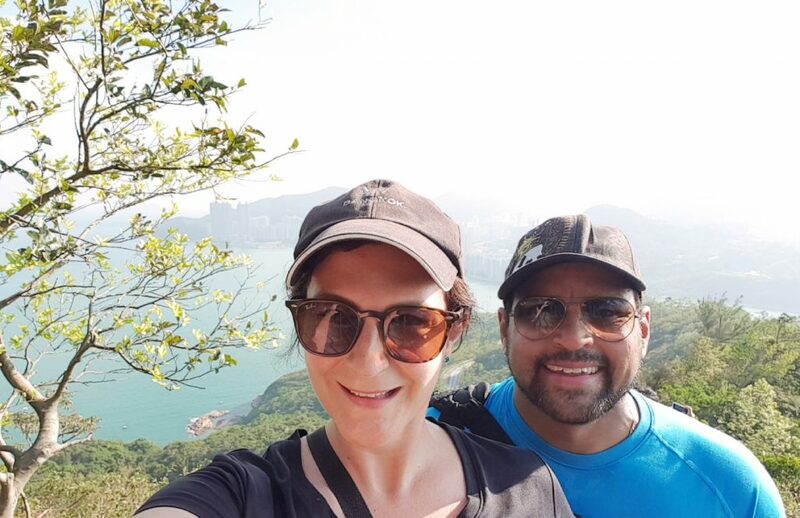 Amanda and Dean currently live in Hong Kong, and they love to travel and try new things. 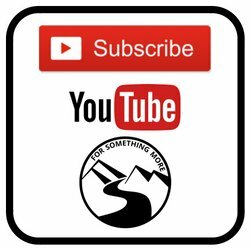 They are starting a travel blog called Scatabout detailing the fun and unique experiences they have had on their world travels. The aim of the blog is to inspire you to also get out there and try something new. Follow Scatabout on Instagram and Facebook, and keep an eye out for their new blog posts coming soon on Scatabout .